In the Gaining of Much, Much Has Been Lost. The last decade plus a couple of years has been the most turbulent. This life adventure includes relocation to a new city from one I had lived in for eighteen years, separation and later divorce, my 16 year-old son suddenly 800 miles away, loss of a job of two decades, semi-retirement, life as an entrepreneur, living on a Caribbean Island, a category five hurricane, second marriage, car accident injuries and recovery, new job, second divorce, rehab for depression and….. whew that’s enough and those are only the major points. It has been said factually that life is the greatest teacher. I know this to be true as the last decade or so of study has given me at least one PhD in how to live life. Regretting anything that has happened would mean regretting who and what I am today. Finding the peace of mind enjoyed and the balance felt most of the time would not have been possible without the turbulence of the last twelve years. Even for the actions and behavior I needed or yet still need to make amends for, there has to be gratitude for the teaching tools they were. In the gaining of much, much has been lost. Relationships are gone. People have left. Possessions have been lost; some have been stolen. Love that was is no more and in other cases it remains carried quietly and silently. Some things have been misplaced and some are gone forever, to where I have no idea. Emotionally I have been crushed and broken open. A good bit of the person I used to be was banished. Then I rebuilt myself better and stronger than ever before into the “me” I am today (with the help of many others…thank you!). What belongings a person cherishes is often not the most valuable in the sense of monetary worth. Some of what I have not longer was worth a good deal, but I honestly do not lament it being gone that much. Recently I began to unsuccessfully sort thought my garage and storage unit trying to find an old trunk. I had no luck and was completely bummed out about it. Then just yesterday, I thought to look behind some things in my storage unit and was ecstatic when I found that old trunk. Actually the container just looks kind of like a trunk and was probably some sort of wooden storage crate originally. I suspect it had a military origin and was used to house equipment judging from interior. It was left behind in a house I once resided at in Colorado Springs, the home of a large Army base. 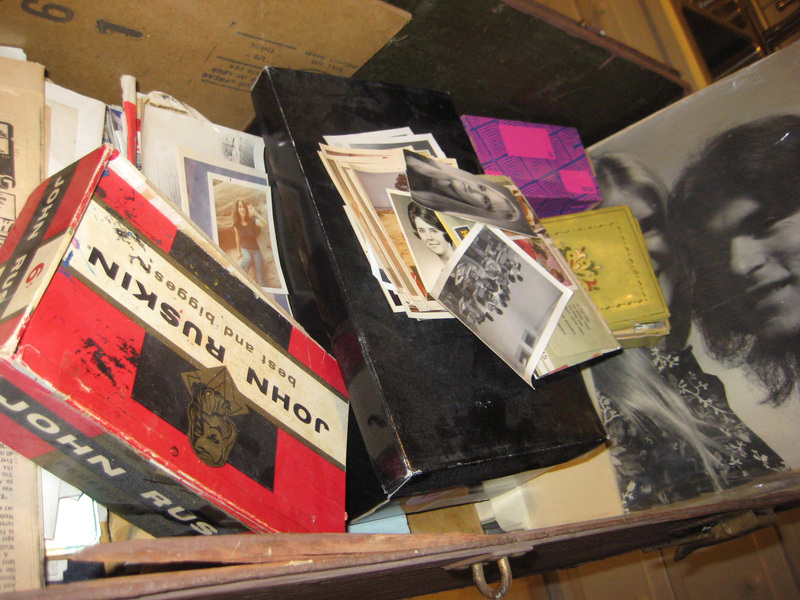 In the early 70’s the ‘trunk’ became the keeper of the treasures of my late teens and early 20’s. I brought the old trunk home last night, put it on the kitchen counter and quickly found myself immersed in what was inside. Thinking for weeks the trunk and all its contents were gone only increased the value of it all. In three hours there was only time to skim the surface. The time was spent going through old pictures of people I used to know, old girlfriends, my sisters when they were very little, my brother, old friends and my high school days. There were letters from family, past loves and even old paycheck stubs from places I worked. I found newspaper clippings about my early accomplishments, school newspapers, my first checkbook, deposit slips and even old airplane tickets including one when I went back to see an old girlfriend in 1972. I believe it is the growth made in the last ten years that makes these old things so meaningful to me. Last evening it was as if I was for the first time discovering bits of myself and feeling the emotions denied before. The contents of the old trunk are not worth more than a few dollars, but when believing it was all lost I would have paid thousands to have them back. I am grateful beyond words for what has been found! In my ‘treasure trunk’ was the following, handwritten on stationary paper. The handwriting is familiar to me, but I can not yet place it. Maybe in time I will. Without an author noted the paper contains “On This Day” which I was able to research and find was written by Howard W. Hunter. This year, mend a quarrel. Speak of it still once more. This entry was posted in Material Things, Self Awareness. Bookmark the permalink. 2 Responses to In the Gaining of Much, Much Has Been Lost. I appreciate how you reframed your losses because it made me thoughtful regarding my own and thankful.